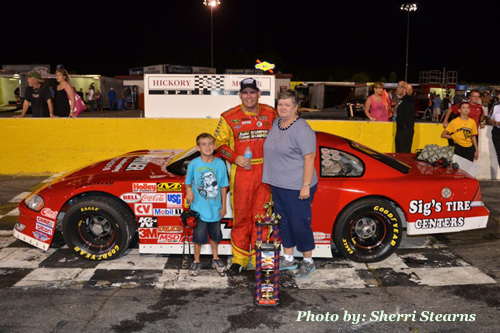 Newton, NC – Keith Bumgarner came out the winner of Hendrick Honda Hickory night at Hickory Motor Speedway on Saturday, taking the checkered flag after a five lap dash in the Bojangles' Late Model division. Drivers fought for every position they could with racing heated in the Paramount KIA Limited Late Model division as Zachary Bruenger took home a hard fought win. Todd Harrington, Carroll McKinney and Roy Smith were the remaining winners in their respective divisions. Two rookies led the Late Model field to the green flag with No. 1 Pietro Fittipaldi and No. 11 Matt Piercy on the front row. Fittipaldi drove on to the lead, ending his run when No. 19 Kyle Moon ignited an engine, sending No. 51 Josh Wimbish into the wall on Lap 6. No. 97 Keith Bumgarner took the lead on the restart followed closely by No. 12 Austin McDaniel in second. The top two battled for the lead until the last caution of the night fell with only five laps to go. With the field together on the restart, Bumgarner took the high side, pulling away and leaving a tight battle for third further behind. Bumgarner took the win followed by McDaniel, Fittipaldi, Sorel and Wimbish. No. 75 Landon Huffman was the quickest in qualifying, leading the Limited Late Models to the green flag. A battle for the lead quickly ensued with No. 55 Zachary Bruenger taking the lead on Lap 9. Just as the lead changed, No. 6 Brandon Hudnall spun in turn 3 to bring out a caution. Only a few laps later, the caution flew again with three cars involved. Bruenger jumped to the lead on the restart, leaving a five car battle behind him for second. As the field looked to settle in, No. 19 Benji Woodward spun on the frontstretch setting up a three lap dash for the checkered. It would take two more cautions before the green-white-checkered was set up, giving Bruenger the win with Monty Cox, Joshua Bralley, Charlie Watson and Dan Moore rounding out the top five. The three remaining divisions were relatively quiet throughout the night with the pole sitters becoming eventual winners in each race. No. 9 Kevin Townsend led the Street Stock divisions, but was later disqualified post-race giving No. 99 Roy Smith the win. No. 16 Carroll McKinney and No. 21 Todd Harrington also led the starting grids, holding off the rest of the field for the wins in the Renegade and 4-Cylinder divisions. Racing returns to Hickory Motor Speedway this Saturday, July 21 with the 61 st Anniversary Celebration presented by Pepsi. A special 100-lap feature will be run by the Late Models with the Limited Late Models, Street Stocks, Super Trucks and Renegades also making appearances.